Researchers have successfully converted fibroblasts (a structural cell) into oligodendrocytes which could regenerate new myelin coatings around nerves. This treatment can be used in myelin related disorders such as multiple sclerosis and cerebral palsy. Cellular Reprogramming is a technique that allows the conversion of one type of cell into another. Although it shares a similar concept with stem cell technolgy, unlike stem cell therapy, cellular reprogramming utilizes direct manipulation of the cell at a genetic level to convert it into another type of cell. Stem cells naturally differentiate into another type of cell. In 2012, Doctor Shinya Yamanaka won the Nobel Prize in Physiology or Medicine for his research on generating induced pluripotent stem cells (iPS cells) through cellular reprogramming. iPS cells are pluripotent stem cells that are artificially derived from normal cells. Researchers at Case Western Reserve School of Medicine have discovered a technique that directly converts skin cells to the type of brain cells destroyed in patients with multiple sclerosis, cerebral palsy and other so-called myelin disorders. This discovery appears today in the journal Nature Biotechnology. This breakthrough now enables "on demand" production of myelinating cells, which provide a vital sheath of insulation that protects neurons and enables the delivery of brain impulses to the rest of the body. In patients with multiple sclerosis (MS), cerebral palsy (CP), and rare genetic disorders called leukodystrophies, myelinating cells are destroyed and cannot be replaced. 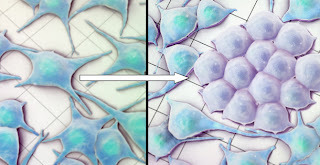 The new technique involves directly converting fibroblasts - an abundant structural cell present in the skin and most organs - into oligodendrocytes, the type of cell responsible for myelinating the neurons of the brain. "Its 'cellular alchemy,'" explained Paul Tesar, PhD, assistant professor of genetics and genome sciences at Case Western Reserve School of Medicine and senior author of the study. "We are taking a readily accessible and abundant cell and completely switching its identity to become a highly valuable cell for therapy." In a process termed "cellular reprogramming," researchers manipulated the levels of three naturally occurring proteins to induce fibroblast cells to become precursors to oligodendrocytes (called oligodendrocyte progenitor cells, or OPCs). Tesar's team, led by Case Western Reserve researchers and co-first authors Fadi Najm and Angela Lager, rapidly generated billions of these induced OPCs (called iOPCs). Even more important, they showed that iOPCs could regenerate new myelin coatings around nerves after being transplanted to mice—a result that offers hope the technique might be used to treat human myelin disorders. When oligodendrocytes are damaged or become dysfunctional in myelinating diseases, the insulating myelin coating that normally coats nerves is lost. A cure requires the myelin coating to be regenerated by replacement oligodendrocytes. Until now, OPCs and oligodendrocytes could only be obtained from fetal tissue or pluripotent stem cells. These techniques have been valuable, but with limitations. "The myelin repair field has been hampered by an inability to rapidly generate safe and effective sources of functional oligodendrocytes," explained co-author and myelin expert Robert Miller, PhD, professor of neurosciences at the Case Western Reserve School of Medicine and the university's vice president for research. "The new technique may overcome all of these issues by providing a rapid and streamlined way to directly generate functional myelin producing cells." This initial study used mouse cells. The critical next step is to demonstrate feasibility and safety using human cells in a lab setting. If successful, the technique could have widespread therapeutic application to human myelin disorders. "The progression of stem cell biology is providing opportunities for clinical translation that a decade ago would not have been possible," said Stanton Gerson, MD, professor of Medicine-Hematology/Oncology at the School of Medicine and director of the National Center for Regenerative Medicine and the UH Case Medical Center Seidman Cancer Center. "It is a real breakthrough."